Always within reach, the spray gives you instant diffusion in complete simplicity. It also enables you to refill your items to be perfumed. In a luxurious glass bottle topped with an elegant lid, you will have no wish to hide it. 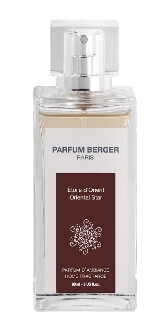 Oriental Star fragrance. An oriental fragrance: opulent & sumptuous, with dominant notes of bergamot (top), red fruits (heart) and vanilla (base).